New wayfinding sign on the 17th/18th Avenue South Greenway, on 17th Avenue just south of South Forest Street. Photo by Wendi. New signs appeared along 17th and 18th Avenues South recently, the first visible step toward the new Beacon Hill Greenway, part of a planned network of neighborhood greenways on Beacon Hill. 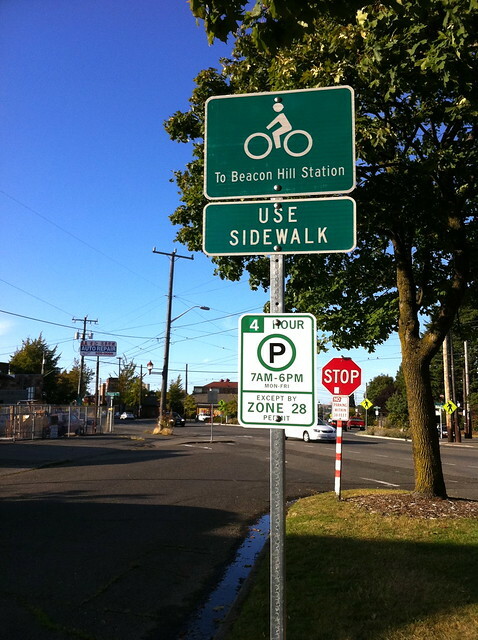 The signs direct cyclists to neighborhood locations such as Jefferson Park and Beacon Hill Station via the greenway route. Seattle’s greenways have recently seen a lot of press, including articles in The Seattle Times, Publicola, Seattle Bike Blog, and The Atlantic Cities. will be installed within the next month. We will also be planting trees along 18th and 17th in order to create a “linear park” from the MTS trail to Jefferson Park. What is the plan for the crossing at McClellan and 18th? That seems like a spot that requires a bit more than the trust that a driver will see a marking in the intersection from enough of a distance to stop. Even as a 6-foot tall man, I feel like I am invisible to drivers on McClellan when crossing outside of the 4-way stop at the 17th intersection, and even that is a crap-shoot if you get a driver who doesn’t understand what the big red STOP sign means. Anyway, is there any sort of plan to install features on McClellan to stop drivers or at least warn them of the bike route crossing; 4-way stop, raised surface, curb bulb on north side, rumble strips, speed bumps, etc? I can’t speak to what exactly SDOT is putting in, but I do know that at this point, the scope of work is limited to signs and pavement markings. Initially it was just signs, but with some lobbying from Beacon BIKES, they agreed to add the pavement markings. The intersection at 18th & McClellan was discussed and it is hoped that yellow warning signs will be placed on McClellan to alert drivers to the crossing bike route. I don’t believe there is any plan to control traffic travelling on McClellan. It is up to biker, walkers and drivers on 18th to be prudent and cross McClellan when it is safe. Greater traffic claming at that intersection may be in the future, but SDOT would need to be convinced and funds would need to be available. I suspect if the route proves popular and more walkers and bikers use the crossing, then traffic calming will happen sooner. I think pavement markings will help, but I hope SDOT is watching that intersection carefully. It’s already a well-used pedestrian intersection (pre-school & library walking route) but drivers still barely slow sometimes. What form would the traffic calming take? Raised crosswalk? Painted crosswalk? Just getting people to park on the north side of the street would do a lot to calm traffic. It’s risky when you’re the only car, but when there’s a line of cars (go Sounders!) traffic slows by at least 5mph. Thanks for all the hard work, Beacon BIKES folks! If Prop 1 passes we would see an improvement at this intersection within a couple years, if not, it may take much longer. Right now we are just getting signs and paint.